02 Feb “Do nut” miss out on our brand new doughnuts! We have two brand new doughnuts launching next week! 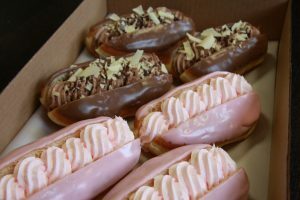 Make sure to head to your local Friary Mill Bakery from Tuesday onwards next week, to try out our new doughnuts! We have available a Triple Chocolate Doughnut as our doughnut special on Tuesdays, Thursdays and Saturdays. A delicious freshly baked and fried finger doughnut split through the middle, filled with a chocolate flavoured cream,finished with a chocolate fondant and chocolate shaving sprinkles. On Wednesdays and Fridays our Strawberry Milkshake Doughnut as our doughnut special. A freshly baked and fried finger doughnut with a strawberry flavoured cream through the middle and topped with strawberry flavoured fondant. We hope you are all as excited as we are for the launch of these new products and we look forward to your feedback on them!